Minneapolis-based artist Chris Mars brings his exhibition “In Preparation of Barrier Transcendence” to renown Culver City gallery Billy Shire Fine Arts on December12, 2009, presenting the sole commercial offering of work from the show which debuted at The Longview Museum of Fine Arts (Texas) in September before traveling on to The Phipps Center for the Arts (Hudson, Wisconsin) in February 2010 and Mesa Contemporary Arts (Arizona) for an extended run commencing in March. Billy Shire Fine Arts, kingpin of the so-called “Low Brow” and “Pop Surrealism” movements, will display some twenty-two recent oil paintings by Mars, as well as a selection of his most recent films including the surrealist meditation “This is No. 14” and the animated tale “Flowers for Jupiter”. In addition, Mars will be presenting for sale his first limited edition multiple, a series of exhibition posters celebrating each of the three public venues for “In Preparation of Barrier Transcendence”. Curatorial attention for the work of Chris Mars continues to expand. In addition to the museum venues mentioned previously, Mars’s work has been featured at the Minneapolis Institute of Fine Arts (MN), Erie Art Museum (PA), Steensland Art Museum (MN), Ruby Green Contemporary Art Space (TN), Laguna Art Museum (CA), American Visionary Art Museum (MD), Frederick Weisman Art Museum (MN), Art Center South Florida and Haas Fine Arts Center (Eau Claire, WI), among others, and is held in the collections of the Minneapolis Institute of Fine Arts, Tweed Museum of Art (MN), Erie Art Museum, Longview Museum of Fine Arts, Minnesota History Center and Mesa Contemporary Arts. His debut monograph, TOLERANCE, was released in 2008 by Billy Shire Fine Arts Press and is available at bookstores internationally. Through his paintings, Mars brilliantly sums up the feeling of being right about something awful. 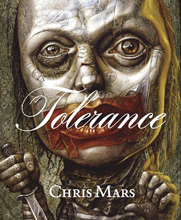 Chris Mars' book TOLERANCE will be available for purchase during the exhibition. "From my hands, my mission: To free the oppressed; to champion the persecuted, and the submissive; to liberate through revelation the actualized Self in those proposed by some to have no self at all. It's in every single one of us, somewhere underneath that word on our chest. In my hands, my version: All art is political in some sense, be it through conformity, reflection, propaganda or rebellion. My paintings are rallies and trials, photographs of a moment when Truth was made public, and Mercy known. Question why a villain is villainized, a victim martyred. Ask why a group is demonized, and the motives for control. See for yourself what the truth looks like in your hands. Dig it up and hold it for a while. This work you see, it's my Truth. But please don't take my word for it." "Minneapolis artist Chris Mars is living proof that F. Scott Fitzgerald was dead wrong when he said there are no second acts in American lives. Though famous in the 1980s as the drummer for alt-rock heroes The Replacements, Mars eventually left the music world behind entirely to focus on the visual arts, now specializing in stunningly evocative, macabre portraits." "His paintings of ghoulish, skeletal crowds and beseeching wraiths, set in gloomy environments that hark back to medieval villages, seem too vivid to have come purely from the imagination. Mars' storytelling on canvas is almost classical in its precision."